Wonder which Thayar is this ? …. 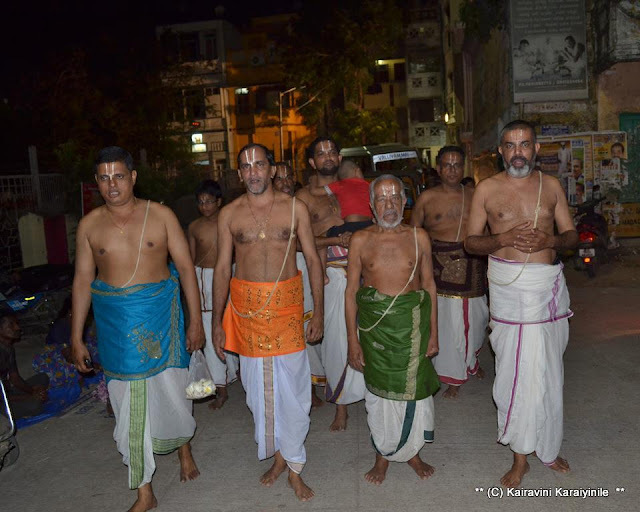 Today 27th Dec 2015 is day 7 of ongoing Irapathu Uthsavam and at Thiruvallikkeni, Sri Parthasarathi Swami blessed His bakthas adorning Muthangi. 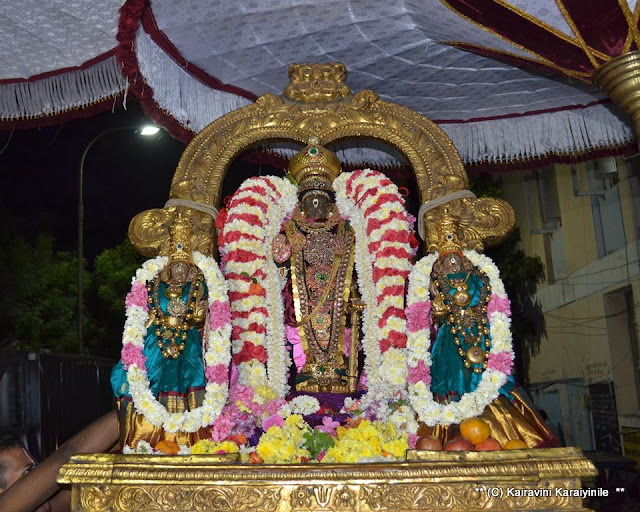 It was indeed a feast to the eyes to have darshan of Paripurnan wearing a dress beautifully woven with pearls still unable to match the blemishless beauty of Perumal. 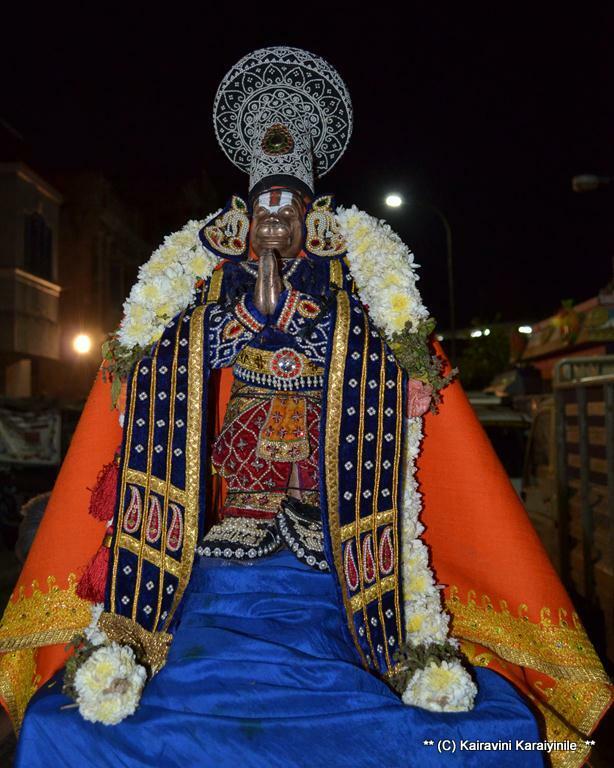 Swami Nammalwar in Nayika bhavam gave darshan in ‘Nachiyar Thirukolam’ dressed as the woman [Parankusa Nayaki] hailing the greatness of Sriman Narayana. 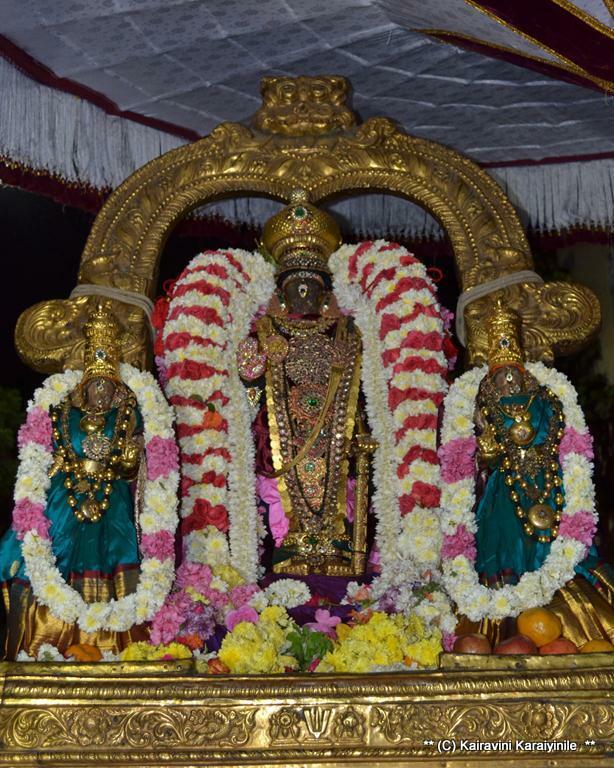 Today on day 6 of Irapathu uthsavam at Thiruvallikkeni, Sri Parthasarathi Swami blessed devotees in ‘Thiru Venkadam Udaiyan” Thirukkolam. Even to those who are used to having darshan of Lord Parthasarathi, He appeared more of the Lord of Seven Hills in tune with the sarrumurai pasuram of Thiruvaimozhi 6th canto ‘Ulagam Unda Thiruvaaya’ pasuram. Swami Nammalwar graced ‘Savari kondai’ usually worn when astride horse. 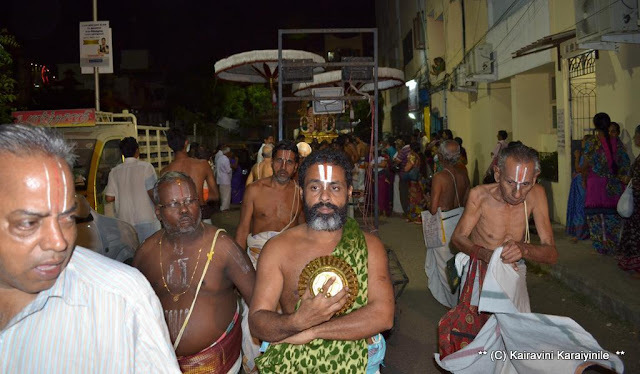 உலகம் உண்ட பெருவாயா! 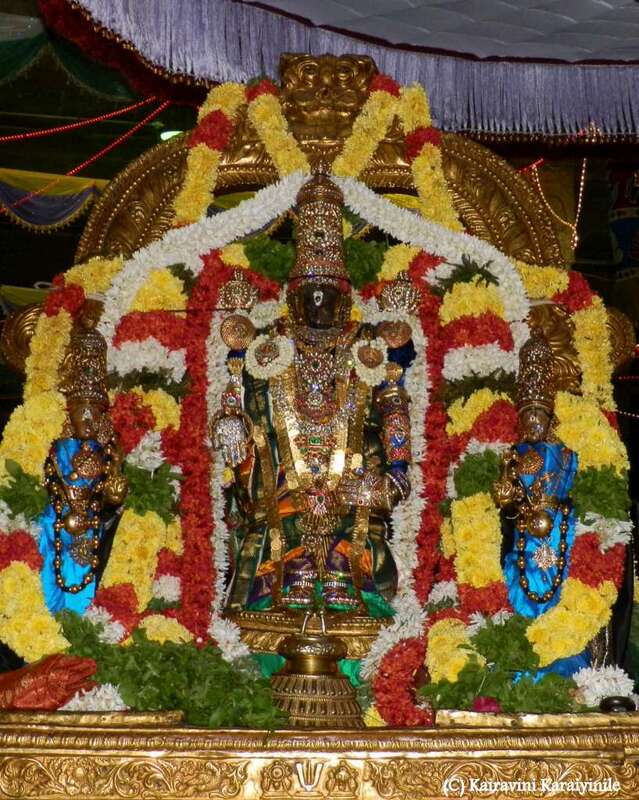 உலப்பில் கீர்த்தியம்மானே! 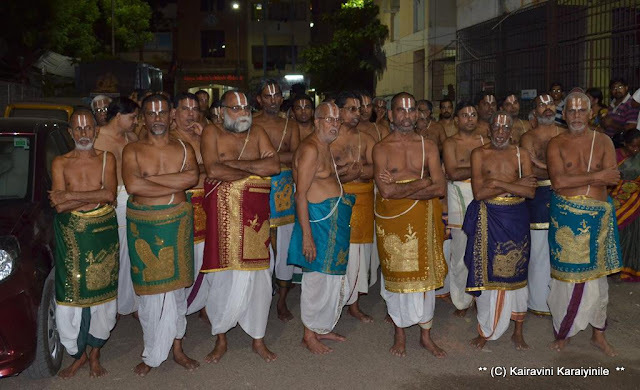 நிலவும் சுடர் சூழொளிமூர்த்தி, நெடியாய் அடியேனாருயிரே! 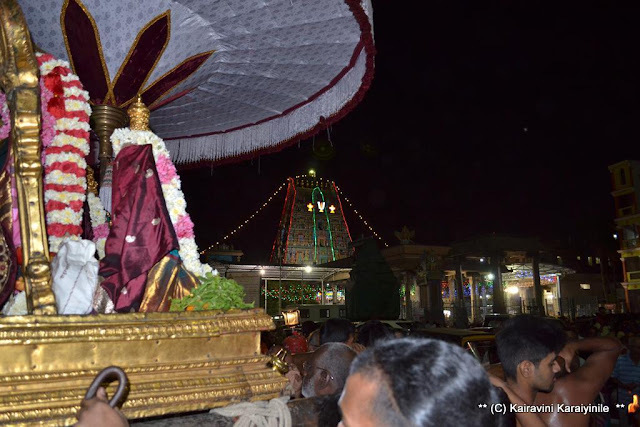 திலதம் உலகுக்காய் நின்ற திருவேங்கடத்தெம் பெருமானே! 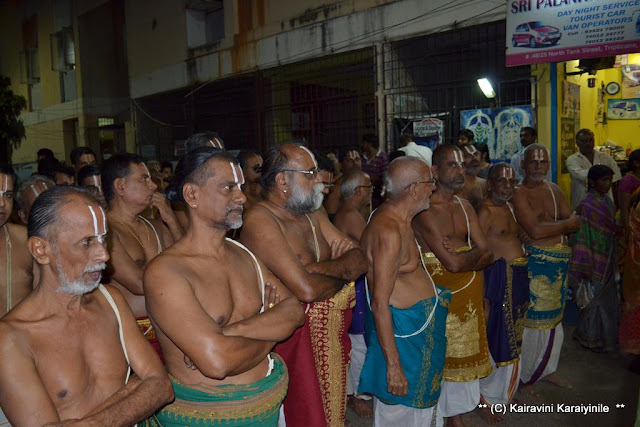 குலதொல்லடியேன் உன்பாதம் கூடு மாறு கூறாயே. உலகுக்கெல்லாம் திலகம் போன்றதான திருமலையிலே விளங்குகின்ற; (பிரளய காலத்தில்) உலகங்களையெல்லாம் அமுது செய்த திவ்ய ஸ்வரூபியான நெடியவனாய் நிற்கும் அந்த திருவேங்கடவனை என்றென்றும் நினைத்து, அவரது தாள் பணிந்து தொழுவோம். 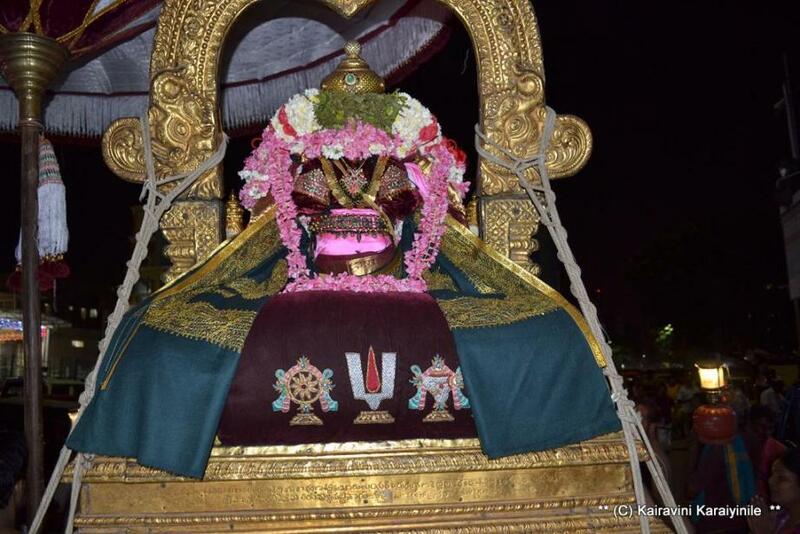 Thiruvengadam (Sri Venkatachala Hill of Thirumala) stands prominent as ‘Thilakam’ – the shining glory of entire Universe. Lord Srinivasa, the bestower of all boons, the Lord who ate the Universe and who is closest to our hearts stands tall at Thirumala – let us fall at His feet, think of Him all the time and do good to all His followers. PS : Adiyen could not attend and missed His darshan ~ the photo here is one take in 2012. 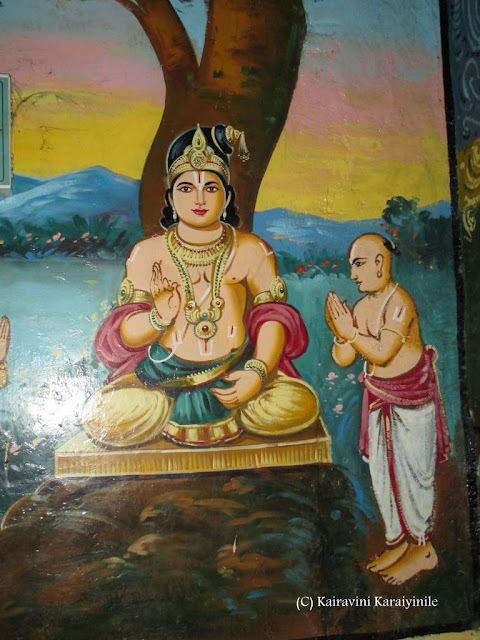 Swami Nammalwar painting as it appears in Thirukadigai [Sholinghur] Sri Akkarakani sannidhi. Irapathu Uthsavam is being celebrated in Divyadesams and today is day5. 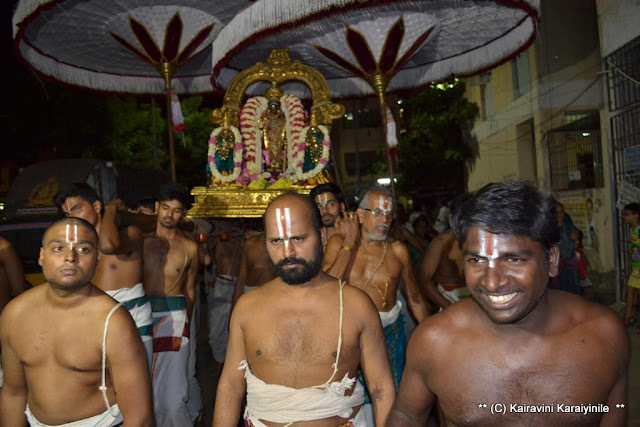 Those who have darshan of Sri Parthasarathi yearn more – everyday, He looks fresh and more radiant shining with the apt sarruppadi of battars. 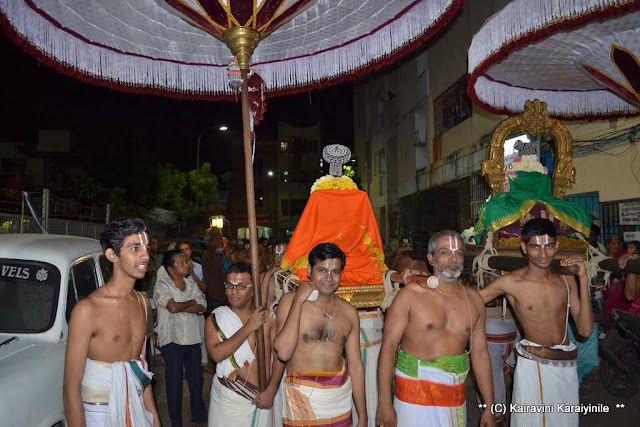 Today it was Pandian Kondai and Sengol [the kireedam known as Pandian kondai as it replicates the one worn by Lord NamPerumal rendered to him by a Pandian King known as Sundara Pandian and the scepter worthy of an Emperor]. 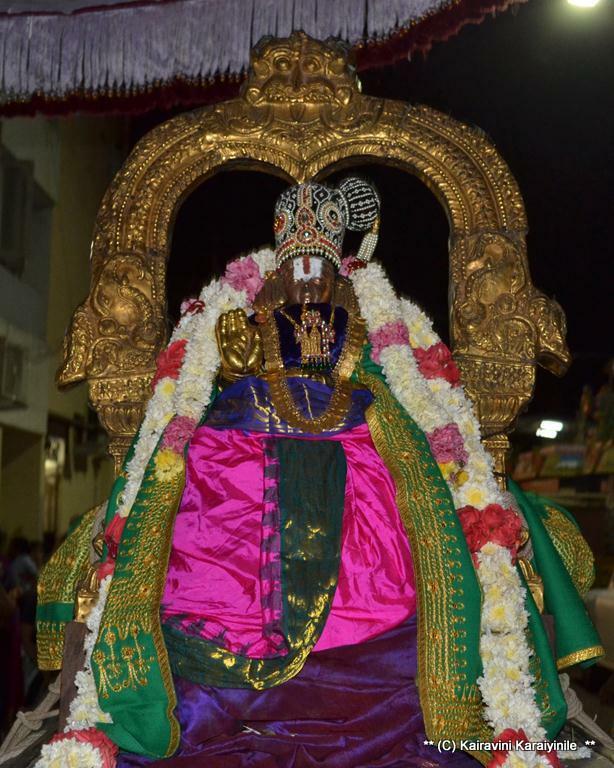 Swami Nammalwar had dazzling muthu kondai. 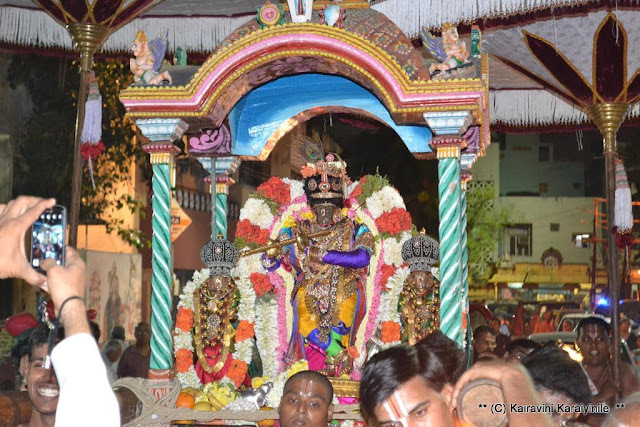 In decad 5 Swami Nammazhwar assumes the form of Parankusa Nayaki (Azhvar's bridal self). In his golden words : ** மாசறு சோதியென் செய்ய வாய்மணிக் குன்றத்தை; ஆசறு சீலனை ஆதிமூர்த்தியை நாடியே** - Azhwar directs us to the complete Sriman Narayana whose radiance is flawless; the One possessing the red-lipped; One more pure than spotless mountain gem ~ to the feet of the One possessing Great qualities totally devoid of any blemish – that Original One – we must pray, fall, follow and submit to the lotus feet – which only will protect us from all sins. 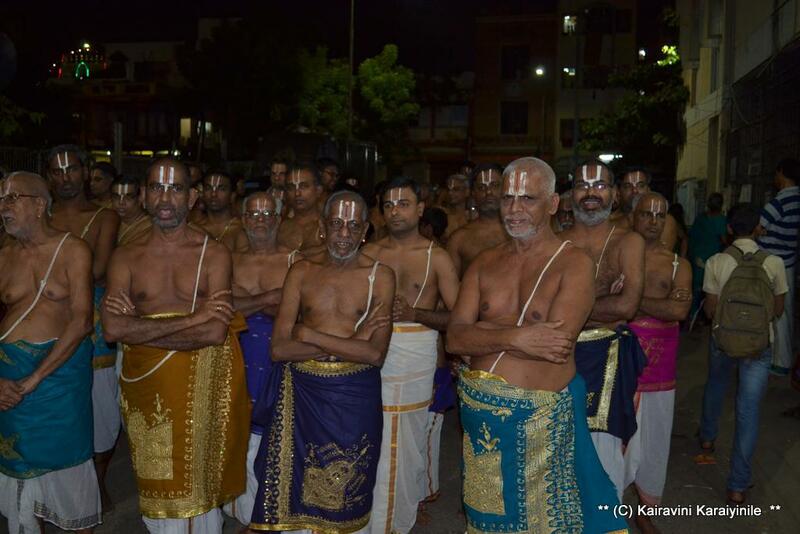 Thiruvallikkeni is a wonderful divyadesam ~ there will be purappadus on so many days – different Uthsavams throughout the year. 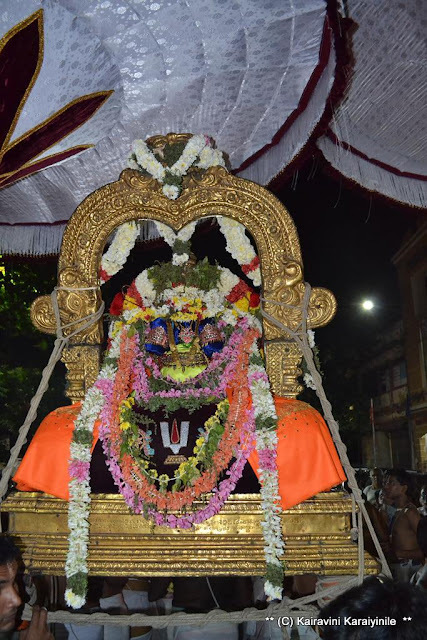 Now Adhyayana Uthsavam – Irapathu is on and today is day 4 – Hanumath Jayanthi too. 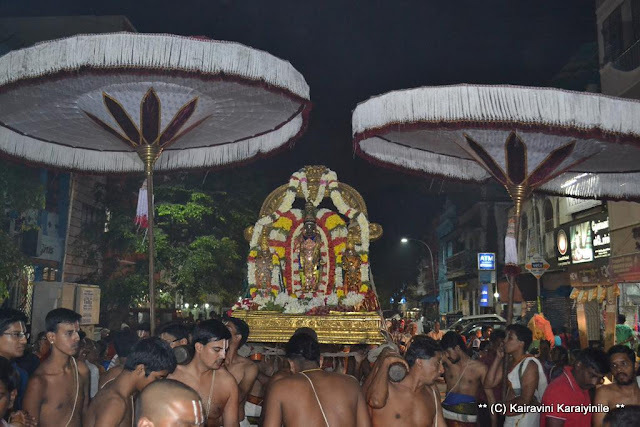 Thus there was purappadu of Sri Parthasarathi, Nammazhwar and Aanjaneyar. ~ and many others offering service to God. 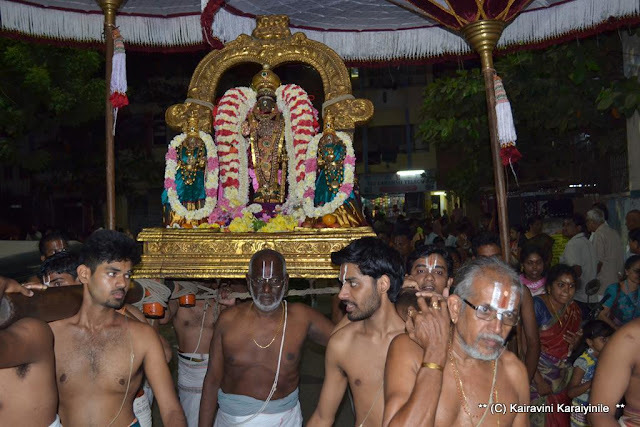 On day 2 of Irapathu Uthsvam at Thiruvallikkeni, Lord who charioted Arjuna - Sri Parthasarathy shone in radiance as ‘Sri Venugopalar ‘ – the cowherd - - one with the Flute and Cows. 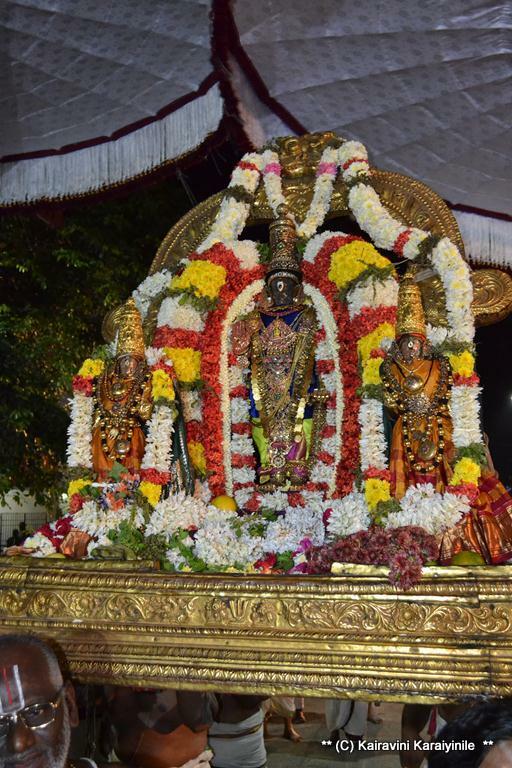 Let us surrender at the golden feet of the Lord of Vaikundam, the eternal, faultless, immeasurable, ever blissful land. 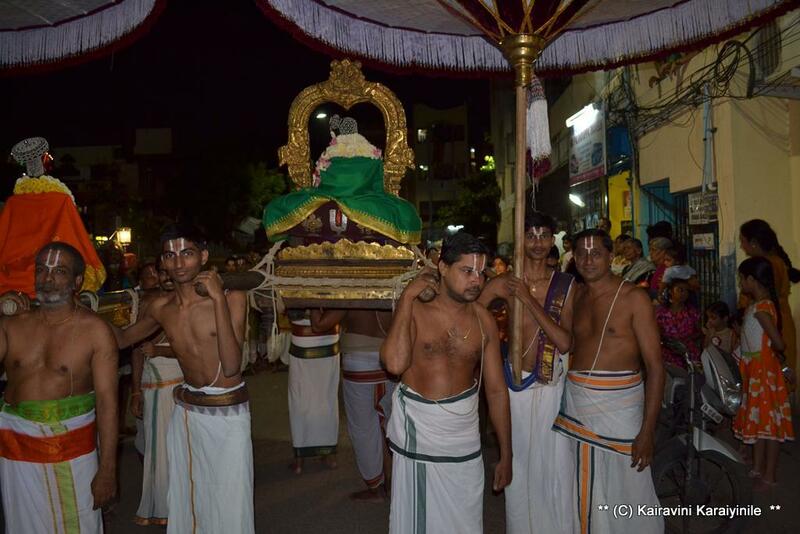 Here are some photos of Perumal taken during today’s evening purappadu. 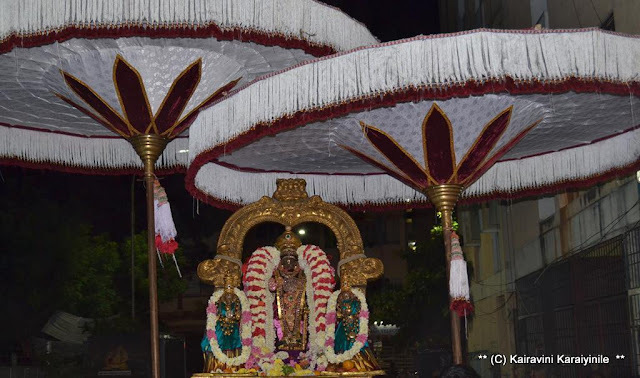 In the very early hours of the morning Sri Parthasarathi bedecked in precious jewels entered Paramapada vasal and gave darshan to His devotees; throughout the day He was seated in the beautiful ‘Punyakodi vimanam’ at Thiruvaimozhi mandapam. 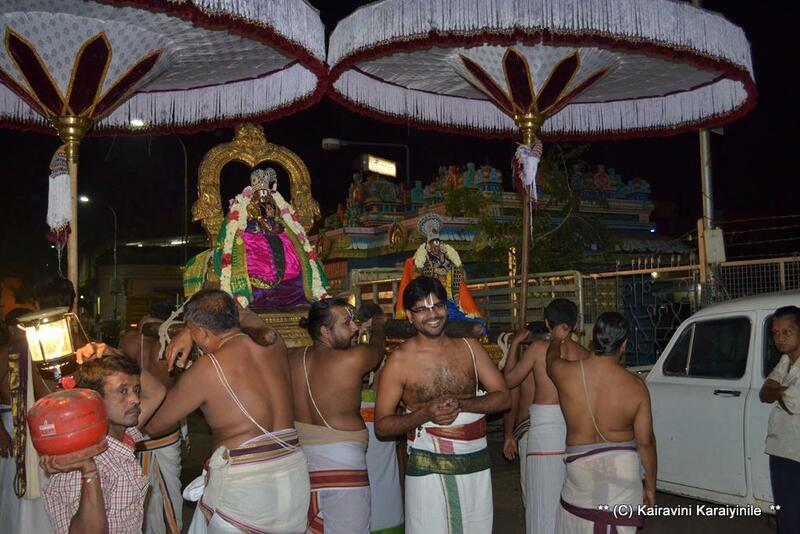 The auspicious Vaikunda Ekadasi heralds the start of ‘Irapathu’ Uthsavam. 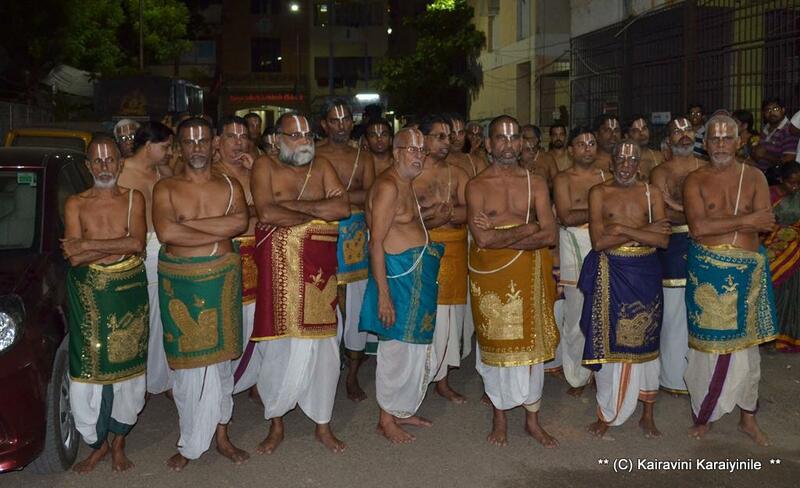 As the name suggests, there will be celebrations for 10 nights. நம்மாழ்வாரின் அற்புத வரிகளில் : “அடங்கெழில் சம்பத்து* அடங்கக்கண்டு* ஈசன் அடங்கெழில் அஃதென்று* அடங்குகவுள்ளே” ~ Can there be more bliss than looking at and understanding the radiance and opulence of Sriman Narayana, enjoy His great qualities and merge into Him ! During Pagal Pathu, the Muthaliyaram and Thirumozhi of Thirumangai Mannan are rendered. It is time for Nammalwar’s Thiruvaimozhi during Irapathu. In the Thiruveethi purappadu, all the 10 days, ‘Upadesa Rathinamalai’ of Acharyar Sri Manavala Maamunigal is recited. 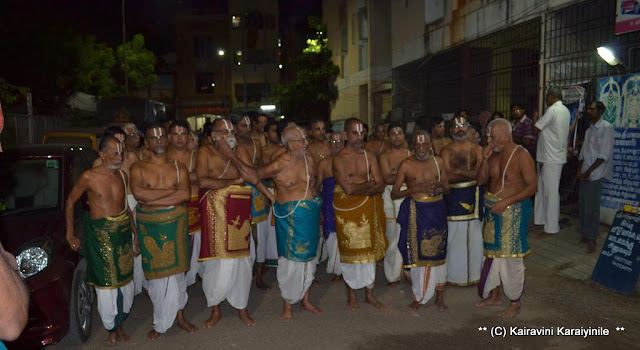 After the conclusion of the Purappadu, inside the temple before the Lord in the Grand sabha of all Azhwars and Acharyas, every day 100 songs from the Thiruvoimozhi of Nammazhwaar gets recited. 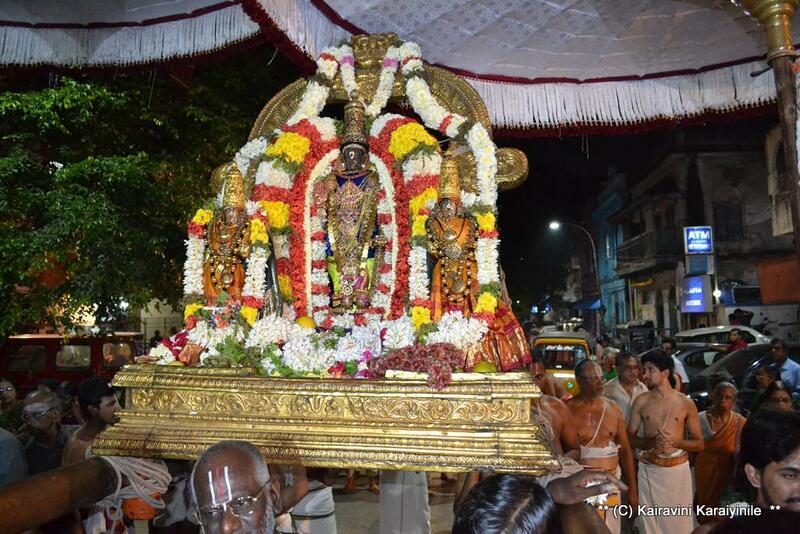 On the night of Vaikunda Ekadasi being day 1 it was ‘muthal pathu’ of Thiruvaimozhi. From today on Paramada entrance gate will be opened every day for days in the evening with Swami Nammalwar receiving Him. Here are some photos of Sri Parthasarathi and Swami Nammalwar of day 1 of Irapathu.